Section 138 of the Negotiable Instruments Act, 1881 deals with the dishonour of cheques in India. There are a large number of cases filed under this section, and these cases are clogging the courts. In this chapter, the author examines in depth the behaviour of cheque dishonour cases in the Indian courts, by looking at data from the DAKSH database across India’s courts. She finds that resolution in most cases is delayed well beyond statutorily prescribed timelines, and that certain banks and financial institutions are frequent complainants. The author makes some recommendations for a more efficient method of solving these disputes, in terms of both steps that credit organisations may take to prevent habitual defaulters from issuing cheques, as well as expediting court processes. A lthough it is known that the challenges the Indian judiciary faces are numerous, few (if any) details are known about the problem of delay in the Indian judicial system.1 Cases relating to the dishonour of cheques represent an identified, yet unexplored black hole in this ocean of cases. Section 138 of the Negotiable Instruments (NI) Act, 1881 deals with the offence of the dishonour of a cheque for insufficiency of funds in the account on which the cheque is drawn. According to the 213th Law Commission Report2 and several newspaper reports, there are between 38 and 40 lakh3 cheque bounce cases, choking the justice delivery system in the country, which makes it clear that this single category of cases constitutes a solid portion of all pending cases in the judicial system. In this chapter, I attempt to examine and understand the behaviour of cheque bounce cases within the Indian judicial system and make recommendations for a more efficient method of solving these disputes. WHAT IS A NEGOTIABLE INSTRUMENT? The law of negotiable instruments is not specific to India; it is a body of laws pertaining to commerce and commercial transactions worldwide. The term ‘negotiable instrument’ applies to any written statement given as security, usually for the payment of money, which may be transferred by endorsement or delivery, vesting in the party to whom it is transferred.5 One of these is a cheque, whose use (and misuse) is governed by Section 138 of the NI Act. The NI Act was passed into law more than 130 years ago in 1881. However, Chapter XVII, comprising Sections 138 to 142, dealing with the dishonour of cheques, was added to the NI Act much more recently, by an amendment in 1988. 1. A cheque should have been issued by the payer for the discharge of a debt or other liability. 2. The cheque should have been presented or deposited by the payee within a period of six months from the date of drawing of the cheque or within the period of validity of the cheque, whichever is earlier. 3. The payee should have issued a notice in writing to the payer within 30 days of receipt of information regarding the return of the cheque as unpaid from the bank. 4. The payer should have failed to pay the cheque amount within 15 days of receipt of the said notice from the payee. The key ingredient for registering an offence under Section 138 of the NI Act is a failure of the payer to make payment within 15 days of the service of the notice. If payment is made within the said period, no offence is committed, but in the case of failure, the offence is perpetrated. Even payment a single day after the completion of the notice period will attract prosecution under Section 138. 127 If a person is convicted under Section 138 of the NI Act, he or she is punishable with two years’ imprisonment, or a fine, or both. As per the First Schedule of the Code of Criminal Procedure (CrPC), 1973, cases filed under Section 138 are non-cognisable and bailable. As far as the history of the NI Act goes, the criminalisation of dishonour of cheques is a relatively recent addition. Prior to the insertion of Section 138, there were civil and alternative dispute resolution (ADR) remedies for dishonoured cheques. Both of these remedies still exist. The civil remedy for a dishonoured cheque means filing a case for the enforcement of a contract. As is the case with separate criminal remedies, Section 138 does not preclude the institution of a civil suit and civil remedies are still available to the payee. ADR methods can also be used for the resolution of cheque bounce cases. Criminal compoundable cases can be referred to Lok Adalats under the Legal Services Authorities Act, 1987.6 News reports7 state that this is how a large number of pending cheque bounce cases have been recently resolved. Criminal liability of the payer of a dishonoured cheque also exists outside the NI Act. Other remedies based in criminal law are to initiate proceedings against the payer under Sections 406 (criminal breach of trust) and 420 (cheating) of the Indian Penal Code (IPC), 1860. It is possible to carry on proceedings under the IPC and the NI Act8 in parallel without falling under the double jeopardy rule defined in Article 20(2) of the Constitution of India. According to the Law Commission of India,9 the reason for the amendment and insertion of Section 138 was the rampant dishonour of cheques, which had rendered cheque transactions problematic. This mistrust of cheques encouraged a move towards cash transactions which brought a host of their own problems, such as counterfeit notes, corruption, and large amounts of untraceable and untaxable money. It was against this background that the provisions criminalising the dishonour of cheques were inserted into the NI Act,10 with the intent of giving cheques credibility and people a method to solve related disputes. What sets Section 138 apart from existing criminal provisions is that there is no need to prove mens rea or the intent of the payer to not pay the promised amount. However, offences under Sections 406 and 420 of the IPC are treated as cognisable and non-bailable, unlike offences under Section 138. In the following sections, I seek to understand and analyse how cases filed under Section 138 fare in the courts. To understand how cases filed under Section 138 of the NI Act move through the courts, an empirical analysis was carried out and a total of 67,433 cases filed in 146 subordinate courts across 21 states were examined. These cases were filed between 1980 and 2015, with 95 per cent of them being filed between 2005 and 2015. These cases, along with their details, were identified and extracted from the DAKSH database. The DAKSH database,11 which is freely accessible, is the largest of its kind in India. It collates publicly available data on cases pending before courts in India. 128 To identify the cases, I specifically searched for Section 138 of the NI Act in the data fields of Act/legislation name and section number. After the details of these cases12 were extracted, a verification was carried out on a randomised set of cases by checking the case status page of the corresponding court website to ensure the details extracted from the DAKSH database were correct. Table 1 shows the details of the cases analysed. Of the 67,433 cases, 27,925 cases were pending and 39,508 cases were disposed. On analysing these cases, it was found that (on an average), cases filed under Section 138 of the NI Act were pending in the subordinate courts for 1,326 days, which is a little more than three years and seven months.13 While this number is considerably lesser than the overall average pendency of subordinate court cases in the DAKSH database, which stands at 2,210 days (approximately six years), it is by no means an ideal duration for these cases.14 Section 143 of the NI Act states that judges should make all possible endeavours to complete trials pertaining to cheque bounce cases within six months from the date of the complaint. The average pendency of the cases analysed is almost six times this. Figure 1 shows the average number of days a case under Section 138 has been pending by comparing the data from 21 states represented on the DAKSH database. The highest average pendency is seen in Gujarat, with cases pending on average for 3,608 days (a little less than 10 years), whereas Himachal Pradesh has the lowest average pendency of 967 days (nearly two years and nine months). Even the court with the lowest pendency has well overshot the time prescribed in the NI Act by two years and three months. Note: Pendency is shown in days. It is also relevant to note that these cases are not merely pending, but also delayed. The Law Commission of India has distinguished these two concepts in its 245th report,15 where it has clarified that pendency refers to all cases that have not been disposed of, irrespective of when they were filed, whereas delayed cases are those that have been in the judicial system for a longer duration than the normal time that such cases should have been. Benchmarking what would constitute ‘normal time’ for a case filed under Section 138 is simple, since the NI Act itself states that all trials pertaining to cheque bounce cases should be conducted as expeditiously as possible and be concluded within six months from the date of filing of the complaint. It is very clear therefore that not only are huge numbers of cheque bounce cases pending in the Indian courts, they are also delayed in courts across the country. In order to understand the problem of delay at a more granular level, the pendency of these cases was calculated at a district level. The cases came from 144 districts across 21 states. There was a not a single district where the average pendency was less than two years. 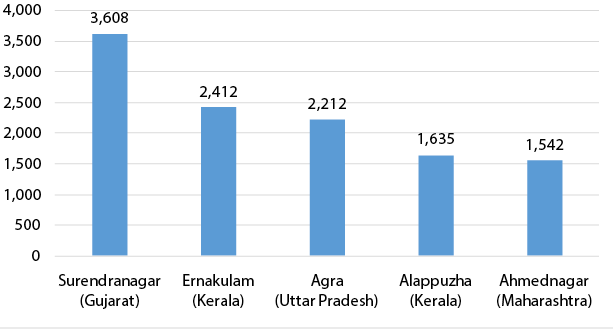 Figures 2 and 3 show the districts with the highest and lowest pendency, respectively, for cheque bounce cases. Notes: (i) Pendency is shown in days. (ii) For this calculation, only districts with more than 500 cases were considered. The districts with the highest average pendency ranged between four and 10 years, while those districts with the lowest pendency averaged between two and three years. 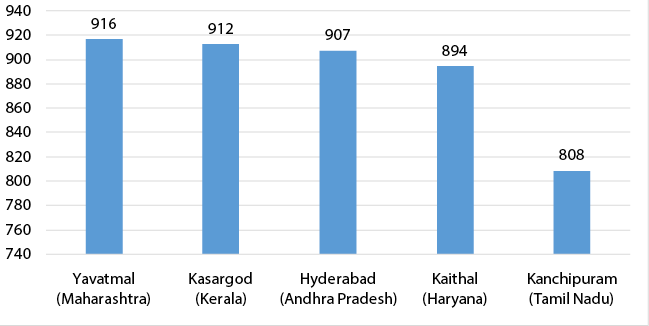 What is particularly interesting is that two states, Kerala and Maharashtra, had districts that fell in both the highest and lowest pendency brackets. This demonstrates beyond doubt that the problem of delay in cheque dishonour cases is a pan-India one and is not restricted to a particular state or region. Figure 4 represents the current stage of pending cases. Of the 27,925 pending cases, a little less than half, or 12,725 cases, are in the notice or summons stage. They are followed by 4,815 cases that are in the evidence or cross-examination stage. As the DAKSH database did not have complete hearing data for these cases, it was not possible to calculate the exact amount of time each case spent at every stage; however, data in Figure 4 shows the stages that occupy most of the courts’ time. It can 131 be seen that most cases are pending in the notice and summons stage, followed by the cross-examination stage. Notice and summons are essential stages, and cannot be done away with. However, courts need to put in place mechanisms to ensure that these stages progress more efficiently, and their time is not wasted. The question that arises with respect to cross-examination is, in an offence that does not require mens rea, why is cross-examination required, unless the accused is claiming that they have not signed the cheque? Table 2 shows the 20 parties who were the most frequent petitioners in the set of cases that were examined. The top petitioner, a financial institution named Shriram City Union Finance, is the petitioner in 1,924 cases or nearly 3 per cent of all cases. This indicates that a large number of unsecured loans are being defaulted on. It is also interesting to see that in this data set, a mere 20 banks16 and institutions have filed 12 per cent of all the cases examined. Though this particular data set is not comprehensive, it is indicative of the kind of data that needs to be collected to help identify the banks that need to take more stringent measures for cheque-based banking. It is crucial to create such a data set at the national level, aggregating the petitioners from all cheque dishonour cases, to help in the identification of repeat offenders. Kaithal District Primary Cooperative Agricultural and Rural Development Bank Ltd. The huge number of pending cheque bounce cases is no doubt worrisome to the courts; however, it is even more worrisome to the litigants. The inability of the courts to adjudicate these cases in a timely manner is a serious infringement of the fundamental rights of litigants. 1. To the greatest extent possible, magistrates should take cognisance of complaints under Section 138 of the NI Act on the day they are presented. When the complaint appears before the magistrate, they should scrutinise it along with any accompanying affidavits and documents. If all of these are found to be in order, the magistrate must take cognisance and direct the issue of summons immediately. 2. Magistrates should adopt a realistic approach to the issue of summons. Summons must be sent by post and can also be sent by email. For the notice of appearance, a short date should be fixed. If the summons is received back unserved, or there is no response to the email summons, immediate follow-up action should be taken. 3. With respect to settlement or compounding of offences20 the court may indicate in the summons that if the accused makes an application for compounding of offences at the first hearing of the case, the court may pass appropriate orders at the earliest. 4. To ensure a speedy trial, the court must ensure that the examination-in-chief, cross-examination, and re-examination of the complainant are conducted within three months of the case appearing before the court. The magistrate also has the option of accepting affidavits from the witnesses, instead of examining them. 133 5. The data reviewed from the DAKSH database shows that courts are not following these directions. Figure 4 shows that a majority of cases are stuck in the summons and cross- examination stages. Analysing the way other countries and judicial systems deal with the issue of cheque bounce is important, particularly to see if their methods can help influence effective recommendations for India. The legal liabilities for the dishonour of cheque in the following five countries were analysed. 1. Australia: Through the Cheques Act, 1986, the Australian legal system prescribes civil remedies in case of dishonoured cheques.21 The payee has the option of filing a civil suit to claim damages. 3. Singapore: The legal system of Singapore imposes a civil liability23 on payers who dishonour cheques. There is no criminal liability imposed. 4. France: While France also imposes civil liability on cheque dishonour cases, it has put into place an interesting system which registers those who have issued more than one dishonoured cheque to a master database called the Fichier Central des Chèques (FCC)24 and bans them from issuing another cheque for five years. 5. United States of America: The law on cheque bounce in the United States of America varies from state to state. There is an imposition of both civil and criminal liability.25 Civil liability includes payment of an amount being double or triple the amount of the cheque, while criminal liability includes imprisonment and imposition of fines. From a statutory viewpoint, there is already a codified law on the procedure for dealing with cheque bounce cases, which states that all cases should be dealt with as expeditiously as possible and courts shall endeavour to conclude the trial within six months from the date of filing of the complaint. Hence, no new statutory provisions need to be added to existing legislation on cheque bounce cases. The Law Commission of India in its 213th report has recommended that fast-track courts of magistrates be created to dispose of cheque dishonour cases under Section 138 of the NI Act26 and that central and state governments provide necessary funds to meet the expenditure involved in the creation of these fast-track courts. The report has not provided any definition of a fast-track court, nor specified the timeframes within which the fast-track courts must dispose of cases or the locations where they should be set up. While the establishment of fast-track courts may help in clearing the backlog of pending cases, it will not solve the problem of increasing the system’s efficiency to deal with future disputes. It is recommended that these fast-track magistrates’ courts are set up in districts with high average pendency and 134 a large volume of cases, so as to quickly dispose of those cases which are already pending. The Supreme Court has issued a series of very relevant guidelines, which if followed will mark a noticeable improvement in the progression of cheque bounce cases. Key amongst these are that statements be recorded only once in court, summons be issued on the same day on which the complaint is received, summons also be issued through faster means such as email, personal presence of witnesses be done away with, witness statements be recorded through affidavits, and the be given the chance to offer a settlement following which the case can be immediately disposed of. The data set analysed in this chapter shows that a majority of cases are at the stage of notice and summons or evidence and cross-examination. Stringent implementation of these guidelines will certainly reduce the time these cases take to move through the courts. Keeping abreast of newer technological possibilities, such as sending summons by WhatsApp,27 is also something the courts could do. While it is crucial that the courts implement statutory and policy changes, for the particular problem, it is also imperative that banks put in place mechanisms that will reduce the number of disputes and help in identifying defaulters more easily. One step that could be taken is for banks to create a master register like the one that France has, which keeps track of all those who have dishonoured cheques. These individuals can be banned from issuing cheques and this list can be provided to credit organisations so that loans and other financial services become difficult for defaulters to avail. If policy changes such as the ones mentioned above are not brought into effect, it is very likely that cheques will stay mere ‘promises to pay’ and not realised payments. 1. Harish Narasappa. 2016. ‘The Long, Expensive Road to Justice’, India Today, 16 April, available online at http://indiatoday.intoday.in/story/judicial-system-judiciary-cji-law-cases-the-long-expensive-road-to-justice/1/652784.html (accessed on 26 September 2017). 2. Law Commission of India. 2008. Report No. 213: Fast Track Magisterial Courts for Dishonoured Cheque Cases. New Delhi: Government of India, p. 10. Available online at lawcommissionofindia.nic.in/reports/report213.pdf (accessed on 26 September 2017). 3. Indu Bhan. 2015. ‘Placing the Burden of Bounced Cheques’, Financial Express, 30 April, available online at http://www.financialexpress.com/opinion/placing-the-burden-of-bounced-cheques/68111/ (accessed on 26 September 2017). 4. Arun Jaitley. 2017. ‘Union Budget Speech 2017’, 1 February, para 120, available online at http://indiabudget.gov.in/ub2017-18/bs/bs.pdf (accessed on 26 September 2017). 5. Ranganath Misra. 2012. Bhashyam and Adiga’s: The Negotiable Instruments Act. New Delhi: Bharat Law House. 6. K.N. Govindan Kutty Menon v. C.D. Shaji, (2012) 2 SCC 51. 7. Press Trust of India. 2017. ‘National Lok Adalat Settles 6.6 Lakh Cases Across the Country’, India Today, 11 April, available online at http://indiatoday.intoday.in/story/national-lok-adalat-settles-6.6-lakh-cases-across-the-country/1/926569.html (accessed on 26 September 2017). 8. Sangeetaben Mahendrabhai Patel v. State of Gujarat, (2012) 7 SCC 621. 9. Law Commission, Report No. 213, pp. 10−12. 10. Law Commission, Report No. 213, pp. 10−12. The Indian courts see millions of cases filed, requiring each case to have a unique identity. To create these unique identities, each cases receives a case number, which is made up of three parts — a case type indicated by an abbreviation, a serial number, and the year of filing. The first component of the nomenclature of cases, or a case type are court-created categories used to identify and classify cases. These categories are based on varied factors, such as the subject matter of the case or the legislation a case falls under. 12. The data set of cases comprised all cases in the DAKSH database that were marked as filed under Section 138 of the NI Act. While it is possible that there were more cases that were filed under this section in the database, if the courts have not provided the relevant Act and section information, then they have not been included, as identification of these cases is not possible. 13. Average pendency is the average number of days an undisposed case in a particular court has spent before that court. It is calculated by adding up the number of pending days for each case and then finding the average based on the total number of cases. To calculate average pendency, disposed cases are not considered. 14. The sample size used for this calculation is 55,00,000 subordinate court cases, which have a date of filing and whose current status is ‘pending’ in the DAKSH database. 15. Law Commission of India. 2014. 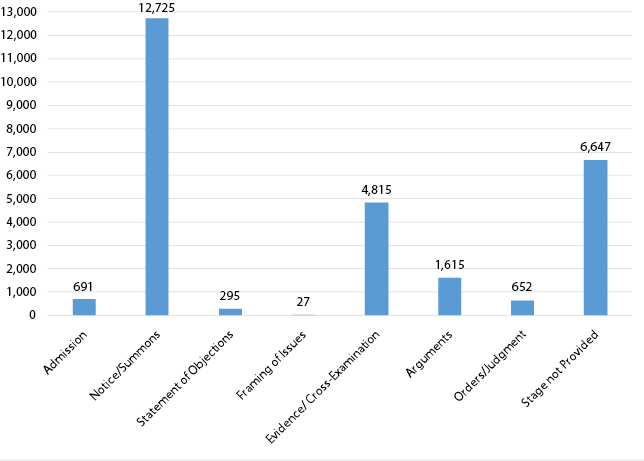 Report No 245: Arrears and Backlog: Creating Additional Judicial (wo)manpower. New Delhi: Government of India. Available online at http://lawcommissionofindia.nic.in/reports/Report_No.245.pdf (accessed on 26 September 2017). 16. According to the Reserve Bank of India’s statistics, there are 2,133 banks in India including nationalised banks, other public sector banks, Indian private sector banks, foreign private sector banks, small finance banks, payment banks, scheduled state cooperative banks, non-scheduled state cooperative banks, scheduled urban cooperative banks, non-scheduled urban cooperative banks, state cooperative banks, district cooperative banks, and regional rural banks. The complete list can be viewed https://rbi.org.in/commonman/English/Scripts/BanksInIndia.aspx#rrb (accessed on 26 September 2017). There is no official complete source that lists the total number of financial institutions in India. 17. Most recently, in July 2016, in Anita Kushwaha v. Pushap Sudan, (2016) 8 SCC 509, a Constitution Bench of the Supreme Court has endorsed its own previous declarations and explicitly declared that ‘access to justice’ is a fundamental right under Arts. 21 and 14 of the Constitution of India. 18. The right to a speedy trial was first recognised as a fundamental right in Hussainara Khatoon (7) v. Home Secy., (1995) 5 SCC 326, and guidelines were also laid out to ensure the expeditious disposal of cases. Subsequently, the Supreme Court has reaffirmed this right in a number of cases. 19. (2014) 5 SCC 590. 20. ‘Compound’ means ‘to settle a matter by a money payment, in lieu of other liability’. 21. Division 2 and Division 3 of the Cheques Act, 1986, available online at https://www.legislation.gov.au/Details/C2017C00074 (accessed on 26 September 2017). 22. Sections 43 and 44 of the Bills of Exchange Act, 1882, available online at http://www.legislation.gov.uk/ukpga/Vict/45-46/61 (accessed on 26 September 2017). 23. Sections 43 and 44 of the Bills of Exchange Act, Chapter 23, available online at http://statutes.agc.gov.sg/aol/search/display/view.w3p;page=0;query=DocId%3A3aae4ed9-4f0e-4155-89b8-1a75ef61fb96%20Depth%3A0%20Status%3Ainforce;rec=0;whole=yes (accessed on 26 September 2017). 24. BIS. 2012. ‘Payment, Clearing and Settlement Systems in France’, available online at https://www.bis.org/cpmi/publ/d105_fr.pdf (accessed on 26 September 2017). 25. National Check Fraud Center, available online at http://www.ckfraud.org/penalties.html (accessed on 26 September 2017). 26. Law Commission, Report No. 213, p. 39. 27. Business Standard. 2017. ‘A First in Indian law: Ashok Khemka–led Court Orders Summons on WhatsApp’, Business Standard, 8 April, available online at http://www.business-standard.com/article/current-affairs/a-first-in-indian-law-ashok-khemka-led-court-orders-summons-on-whatsapp-117040800389_1.html (accessed on 26 September 2017).